Two e-mails and several Facebook posts from a Dare County commissioner and the owner of the Pirate’s Cove Yacht Club have inflamed an already sensitive subject — paying to dredge Oregon Inlet with money from a fund now restricted to beach nourishment. The e-mails and posts emerged from earlier conflicts between using money from the Dare County Shoreline Management Fund to dredge the inlet or pushing for legislative authorization to levy an additional quarter-percent local sales tax, which now appears unlikely. Some are questioning their timing and rationale: The Board of Commissioners seemed to have settled the issue when it voted unanimously June 1 to pursue the Shoreline Fund option, which would require the General Assembly to amend a state law. Under the law, the 2 percent of the occupancy tax that goes into the Shoreline Management Fund can be used only for beach nourishment. Pending legislation would provide $4 million from the state for inlet dredging. The county has promised to contribute another $3 million. County commissioners backed off of the Shoreline Fund option for their share early this year in favor of the local sales tax increase. When that stalled in Raleigh, they shifted back to the Shoreline Fund idea, which previously created an uproar during a Board of Commissioners meeting. Now, apparent miscues and political arm-twisting have put some community leaders in a position of choosing sides between beach nourishment and inlet dredging. Most favor both. But the latest behind-the-scenes rhetoric suggests additional pressure for broad support to ensure passage of legislation authorizing the use of Shoreline Management money for dredging. Here’s what Jim Tobin, the Pirate’s Cove owner, wrote to Nags Head officials in a June 5 e-mail. Tobin is chairman of the county’s Oregon Inlet Task Force Advisory Committee. I have heard through the grape vine that there is a large group of citizens that are in the process of obtaining legal counsel to seek an injunction against all beach nourishment/re-nourishment North of Oregon Inlet in Dare County. This injunction will seek definitive proof that zero sediment from nourishment projects in all of the northern municipalities are not contributing to the shoaling in Oregon Inlet. I was told that they will be seeking this injunction because of the total lack of support from the municipalities that they feel are contributing to the shoaling problems at Oregon Inlet. But some town officials took the e-mail as a warning to get on board with the occupancy tax option. Town leaders are concerned that tapping into the Shoreline Fund could imperil planned beach nourishment projects. Nags Head will soon have to consider re-nourishing. 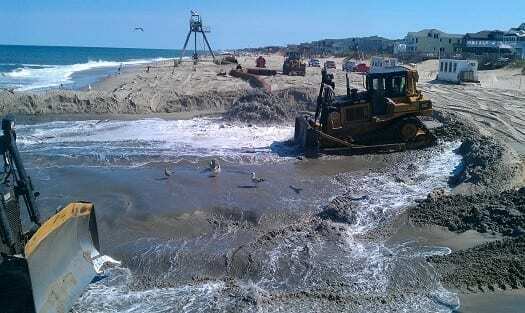 Duck, Kitty Hawk and Kill Devil Hills have projects in the pipeline. Boswell reposted on her Facebook page an item from the Eye on Dare blog that highlighted Commissioner Warren Judge’s “apology” to the rental industry on behalf of the board at the June 1 meeting over the occupancy tax muddle. The occupancy tax is paid by visiting renters. “Don’t apologize on by behalf,” she wrote. “I don’t owe the ‘Rental Industry’ an apology. In another post on Facebook, she wrote, “Fishermen and like minded people UNITE!!! The Voice directed questions to Boswell about her e-mail and Facebook arguments. Boswell said she wanted to see other measures, including offshore hardened structures, to augment sand on the beach.